If the Trinity College Schools’ Competition may be taken as any kind of barometer, the future of history seems distinctly bright! First held in 1992 for the college’s quatercentenary year, the competition is organised by the Departments of Medieval and Modern History and the Department of Teacher Education. On 15 May, five medalists and six runnersup, along with their teachers, attended a buffet lunch in Trinity College, hosted by David Dickson (Modern History), Katharine Simms (Medieval History) and Susan Parkes (Teacher Education). 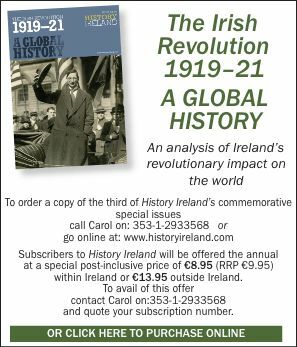 Guests included Síle Sheehy (Irish Times), John McCarthy (Waterstone’s), Ronan Gallagher (Four Courts Press) and Tommy Graham and Rod Eley (History Ireland). Specially commissioned gold and silver medals were presented by Ronan Gallagher to the first and second prizewinners in the senior, transition and junior categories, those who were highly commended were awarded certificates and all received book-tokens from John McCarthy of Waterstones. The senior gold medal went to Clíodhna MacCague (Dominican College, Galway) for an essay on a medieval theme, ‘Damnait of Sliabh Beatha’. The silver medal went to Elaine Deegan (St Mark’s Community School, Tallaght), while Justin Cramp (High School, Rathgar), Stella Rogers (Wilson’s Hospital School) and Jean Sorohan (St Clare’s College, Ballyjamesduff) were highly commended. Katie Hayes (St Nessan’s Community College, Limerick) received the transition silver medal for an essay on the Great Famine, with Carol Kerr (Dundrum) and Lara Browne (Tulla, Co. Clare) highly commended. Meadhbh Lysaght (Notre Dame des Missions, Churchtown) won the junior gold medal for an essay on the Dublin Fruit and Vegetable Market (which appears on p.42 of this issue). Second was Sinead Ward (Mohill Vocational School, Co. Leitrim), with Saranna Fanning (Coláiste Choilm, Ballincollig, Co. Cork) as runner-up.